I really just wanted to sketch this cool ring I bought in Worms, Germany last winter, when I visited an old friend in that medieval city of Luther-fame. We stumbled upon a craft fair/party in one of those deep courtyards you find in old cities. There was a bar among the sellers’ booths, and a sausage grill in the courtyard, it was about -5˚C with dry crunchy snow, but people were drinking, eating, smoking outside, and looking at the wares. I picked out this medieval/punk-looking ring. The young silversmith said she makes her jewellery by melting down old coins. The sides of the three large black pyramids are enamel. The ring almost looks menacing. I like clunky, funky, not-so-delicate rings. They work well on my broad hands and fingers. 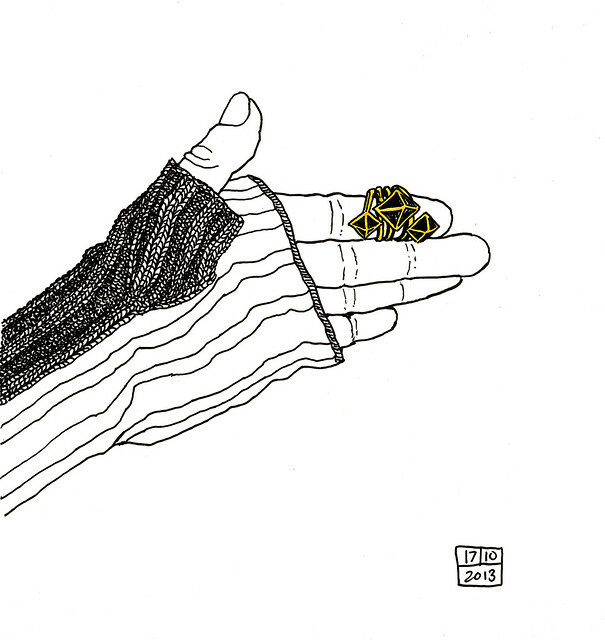 But when I held the ring to draw it, I ended up drawing my whole hand with its fingerless glove. (The gloves are a set my mother knitted for me so I can keep my hands and wrists warm when working on the computer in the cold season.) I got obsessed with drawing the knit texture more than anything else. I stopped it after a while, realizing it would take me an hour to draw the whole glove — drawing the knitting was almost as tedious and time-consuming as knitting itself. But obsession is not the right word; I was enjoying the meditative aspect of drawing each piece of thread. And my mother gets that meditative joy out of the actual knitting: she can knit a pair of socks in an evening while watching TV, she finds it relaxing and her fingers do it automatically. I never even got close to the zen stage of knitting. I struggled with it in elementary school, found it boring, my fingers too clumsy for it, so my mother secretly finished my third grade knitting class project, an orange sweater with a cable knit front for my teddy bear. I think she may have even unravelled the few sloppy rows I had managed, then started over. All even loops and expertly braided cables, it was a thing of beauty, and my teddy and I basked in it. If there was a Best Dressed Teddy Ever list, he would have made it. And I got an A that I did not deserve. But in this case I was so relieved to have escaped the prison of knit that I didn’t even feel any guilt. I was also annoyed that the boys got to take woodworking and build cool stuff like bird houses and possibly even clunky medieval-looking jewellery, while the girls had to do needlework and crochet pot holders. I knew, without being able to put it into words, that my cheating was an illegal response to an illegal system, which made the cheating completely OK.
That was probably the last school year in Germany when boys and girls had to take these gender-separated classes. My parents smiled at my complaints, but in hindsight I was right. It was a no-brainer to me, and it seems like such a no-brainer now: the young silversmith grew up being able to choose knitting or enamelling or both. But what are we accepting these days that we shouldn’t?